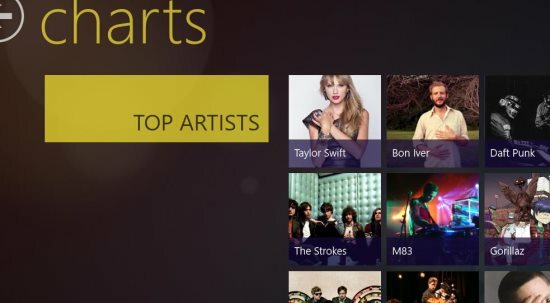 I Love Music is a free music app for Windows 8. You can also find: song lyrics, new songs, artists, etc. Also find: new artists, their biographies, view their upcoming shows, and book tickets using this app. The app size is just 9MB and needs a continuous internet connection to run this app. I Love Music app is a useful app for music lovers. You can find all the info you need on any artist and the upcoming shows of the singers. You can also find lyrics of songs, biographies of artists, pictures, and much more. Let’s see how to use this music app on Windows 8. Install and launch the app. You will see the interface as shown in above screenshot. You have to choose your favorite three genres from: acoustic, ambient, blues, electro, emo, hip hop, metal, pop, rap, rnb, and rock. Then you will see the interface as shown in below screenshot. Charts: Click on charts and you will see: top artists and hyped artists. In top artists you will see various artists as shown in below screenshot. Choose any one of them and you can view: biography, Twitter, discography, shows, pictures, player, and similar. Same applies for hyped artists; but you will see the most popular artists in this section. Around Me: In around me section, you can view the shows that are happening around your place (as the app uses your location access). Click on the upcoming show and you can book tickets directly using this app; by clicking on the more about the show option as shown below. Search an artist: Click on this option and you can search for the artists of your choice. Enter the name of the song or artist name and you will find the artist or song. In the main interface you can see my music; using which you can play music from the music library of Windows 8. I Love Music app is completely free. You can play the music from the music library. You can search for artists you like. You can view the: pictures, biography, lyrics, discography, and shows. Book tickets directly from the app. Use the app in Snap mode also. Find the app in Music & Videos section of Windows Store or just use this link (open in Internet Explorer of Windows 8). Then view the app directly in Windows Store and install it. You can also try other entertainment apps like: Smart Music and Live Scores Hub App. 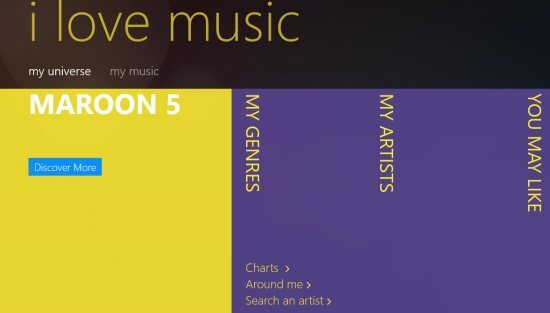 Songza Music App for Windows 8: Right Music at Right Time!